John Eliott Lavender, known as Jack, was born in Penistone in 1895 whilst the family were living on Sheffield Road. They later moved to Grimesthorpe Road Sheffield. Jacks father John Lavender worked at Atlas works and upon leaving school, Jack followed in his footsteps. In 1915, Jack married Edith. Jack was a member of the York and Lancaster regiment serving with the 7th Battalion, the pioneer battalion. He arrived in France on the 13th July 1915 serving first as a Corporal and then as a Sergeant. Jack was commissioned in the Lincolnshire Regiment on 6th February 1917 serving with the 10th battalion the Grimsby Chums. 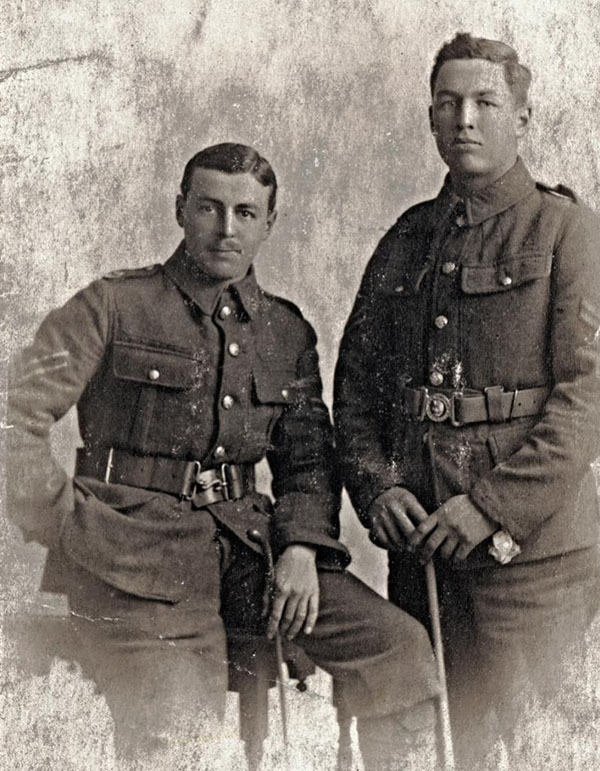 "Night of 25 – 26 furnished a working party of 200 men under 4 officers, 2nd Lt Lavender found 1 off and 1 Pte of the 4th Seaforths wounded in front of our line near MI Pleasant Wood. They had been lying out since attack of 23rd Casualties hit." Whilst on home leave in 1916, Jack and Edith conceived a child. Unfortunately, Jack was killed on 28th April 1917 at the Battle of Arleux, and never met his son John, who was born on 1st June 1917. Jacks body was never recovered. In 1924, the Commanding Officer of the Batallion, Lieutenant-Colnolel Vignoles wrote back to Edith , who had written to Mr Cox, the secretary of the 10th Lincolnshire association, asking for information on her husbands death. Jacks son, John “Alan”, grew up intensely proud of his father despite never meeting him. Jacks widow did marry again but grieved for her first husband until the day she died. Jack is remembered on the Arras Memorial. His brother Wilfred was killed on the 1st July 1916, the first day of the Somme Offensive and is remembered on the Thiepval Memorial.